According to our blog historian, we started covering Clearance in 2013, soon after founding members Mike Bellis and Arthur Velez moved from Ann Arbor to Chicago. We've been pleased to feature their releases over the years, and none more so that their new At Your Leisure. Here the quartet takes a half step away from slacker pop and a big step towards the guitar pop associated with New Zealand in past years and, more recently, Melbourne, Australia. There are aural connections with The Clean and other early Flying Nun bands, as well as more recent worthies such as Auckland's Surf City (check out "Haven't You Got The Time"). The result is a set of songs that is lean, breezy and full of chime and jangle. The band is tight, the lyrics are worthwhile, and the performances shine throughout -- but especially on the up-tempo songs. 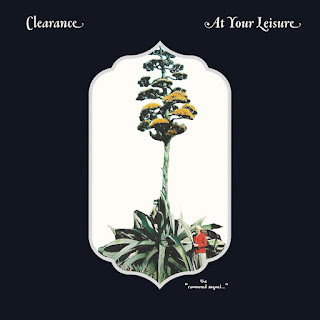 In our view, Clearance has been one of the better Midwestern bands to appear here, and this album is a superb justification of our opinion. Clearance are Mike Bellis, Arthur Velez, Kevin Fairbairn, and Greg Obis. At Your Leisure is out now in digital, vinyl and cassette formats via Topshelf Records.